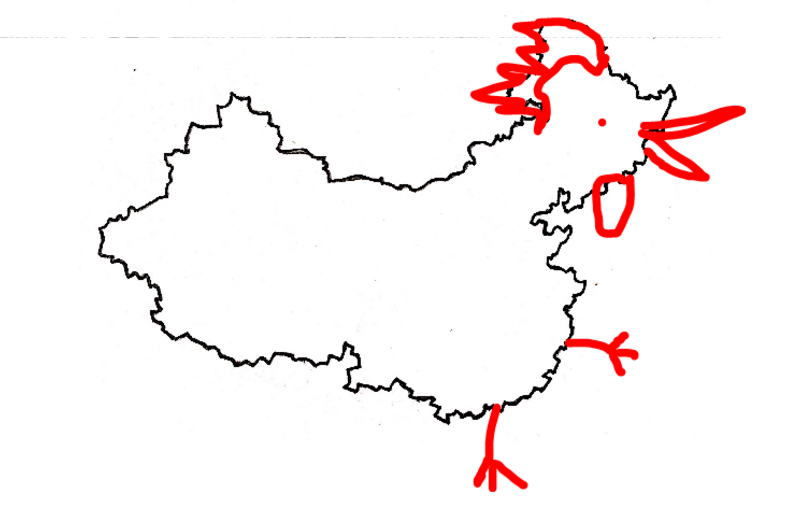 In the rooster body of China, my parents’ hometown sits right below the neck, above the belly. The journey swallows you. You used to cross Shanghai to Qidong on a bus with seats sponged up in old cigarette smoke, rolling eventually onto the loading dock of a giant ferry. A big puff, the doors crack open, then you were free to wander, ducking around truck drivers flicking sunflower shells and spittle from their cabs, stopping your breath every time you caught a whiff of exhaust. Root soil from thousands of trees yanked from the riverside stirred permanently into the Yangtze river. Huge swirls of mud yellow off the edge of the boat. This time, Xiao Gong Gong collects our family and luggage in the back of boxcar van from Shanghai Pudong International Airport. My parents have filled the six suitcases with vitamin bottles, beef jerky, down jackets and New Balance shoes, to be replaced with a full shopping cart of salty-sweet treats and Ziploc gallon bags doubled over raw jellyfish in saltwater on our way out. None of us know who the driver is. Great Uncle hired this man, says Mom, then, He’s a relative we don’t know, or His friend maybe. Hmm. They yell loudly to each other, or rather, talk in a Chinese conversational pitch, while we receive rustling pink bags from Xiao Bu Ah filled with kumquats, apples, bananas and hardboiled eggs. We wake up pulling in backwards down the side street where my grandparents live. A DING in my head, recognizing the fruit stand across the corner, stacked with bright plastic tubs. The worker’s surplus stand next door dangling rubber boots and camouflage jackets like mobiles from the ceiling. The city repeats: a tessellation from layered memories of childhood visits. Dreamlike. A small bridge comes into and I have a vision of steaming sweet potatoes unwrapped from foil, once bought from a passing street cart in in the middle of winter. I run up the stairs of a shuttered Korean market and jump into a photograph of myself at age four or five, wearing a white and blue patterned jumpsuit, sitting on a matching spinning spaceship ride of a small theme park. The park’s flying swings, Octopus teacup ride and cartoon train set – it was hard to tell how long they had been sitting and rusting. Waiting. Every visit to this city is a sci-fi trip. The parallel world where my parents stay in China. It’s the nightmare fantasy of every American Born Chinese kid. Getting sent to the other end of the world, dragged by one ear, dropped into the hole you dug in the Shepardson Elementary School sandbox through the Earth’s Core. China. Finish your dinner. Stop crying. No one in my extended family ever joined my parents in the United States. A handful few have drifted to Shanghai, Nanjing. Most everyone remains in Qidong. This is the city of our alternate lives. Qidong children, running along the streets, exchanging high notes with shopkeepers, slipping on fish heads in open air markets. Ducking through Renming Park, where Chinese Erhu mixes with throbbing pop when grandmothers come swaying in formation across from ballroom dancers gliding on cobblestone. Transplant us from Traut Core Knowledge to Zi Wei Middle School where my parents sent us to “exchange” for a summer: red scarves, synchronized exercises I watch from above with the kid nursing a fake bellyache. I peed my pants on that playground, when the 5th graders brought out water balloons. I mention this theory to my brother. Yeah I guess it’s scary. I wouldn’t have been born. My visions left out the One Child Policy: parents doting on a generation of Little Emperors and ghost brothers. Dad came to the States on fellowship to the University of Colorado Boulder. In his physics pHD thesis, Measurements of Gluon Spin-sensitive Quantities at the Z0 Resonance*, he thanks my mom for “her support, encouragement and home cooking,” and “my little daughter, Bonnie, who always makes me feel happy and relaxed” (Figure 1.2 ). I was one year old and could balance on the palm of his hand. From what I can understand of it, my dad’s physics research involved work with particle accelerators, predecessor work to the discovery of the so-called God Particle using the Large Hadron Collider LHC. Researchers have since moved on to use the LHC to create mini black holes, which would prove the existence of alternate universes. Don’t take my word for it. Everything I know about quantum physics and interstellar travel can be played on my childhood Yamaha PSR73 electric keyboard in VOICE 55: FANTASY1. Instead, pop in a Star Trek laserdisc. Linger your eyes on the vaguely pornographic episode titles of the first season. Episode 4: The Naked Time. Pick Episode 3: Where No Man Has Gone Before. Watch the crew fly to the edge of the galaxy, towards a floating magenta cotton candy mass. The ship enters the magenta and the ship’s monitors fill with pink, fleshy, pulsating blobs: basically, an ultrasound. Fidgeting at the table. The puzzles in front of the TV, abandoned. She slaps the soup spoon away, guides a wrist towards the egg dumplings that she does not want to eat. B, can you use your words? What’s wrong? Yeye, squeezed over at the edge of the table, Nainai’s eyes lidded. A newly hired live-in helper perches in the kitchen, apron sleeves pushed up. My grandma has constantly reassured us that she feels better than ever. She takes daily walks to the market even in the rain. Rest easy. Right ear, a deafness. Our communication comes down to peas and wood ear mushroom spooned into a tiny bowl for my brother to reach, to the braised ribbon fish balanced closer for my dad. B’s eyes widen, a searching, stricken look. Her mouth curves into a horseshoe, upper lip protruding. Please, cry. Please. Maybe stressed from the jetlag, the country, ignored at the dinner table. She can’t tell us. My relatives think that my sister cannot understand Mandarin. B is the smiling center of the table, laughing, taking photos on Mom’s iPhone. How would my parents have translated Global Developmental Delay? Dad praises B the next morning for not making a scene in front of Grandpa and Grandma. Maybe most people remember this, but I forget that my parents are also children. The drive to Mom’s side of the family takes us out of the city into Hui Longzhen, the rural equivalent of the suburbs. The buildings are made of concrete and lumpy bricks, the floors packed dirt. In my scavenged understanding of my parents’ past, they both grew up this way, swimming in small creeks, flying dragonflies like kites, catching bullfrogs between vegetable patches. When I do the comparison, it’s clear that 90% of this image was taken from Taiwanese pop sensation Jay Chou’s song “Dao Xiang” (Fragrant Rice). Gonggong, Bu Ah’s old home has been leisurely curated in their memory, or somebody’s memory, portraits up high by the front the entrance, a room full of umbrellas, a jar full of nail clippers, glass shelves of old photos crushed and folded. The yard remains the same, a kumquat tree squatting below the garden on an embankment, one bright orange dot floating. Chickens on the opposite bank appear to orbit this kumquat sun. The room overflows with wrinkles, black and yellow teeth flashing towards us – sisters of aunts of husbands of brothers of cousins, a room full of strangers, blood. Then faces we do recognize, like wax statues or cartoons, completely unchanged. My brother and I are stranded to our own corner of the table. Each time I open my mouth to speak to the woman on our left, I remember I do not know what to call her. Aunty? Senior Grandma? Second Aunty? Without knowing how to 称呼, I can’t speak to her. We flip through a photo album Mom put together. It’s the anniversary of Grandpa’s death. Feeding goats! GOATS! Long stalks of reedlike grass yanked from my hands smack by smack with a pungent green smell. I charge down the roughly paved path, a rock studded black mass. Slow down, Grandma calls. Ignored. Faster. Faster. Faster, flat into my face. Knees bleeding, crying, carried back into the house. No goats fed. I still have that scar. I need a walk and take my sister outside. Raw shrimp swimming in sauce, clovers in soup, fish bones excavated to the spine. The more muffled the conversation unspooling from the lazy susans the more I understand of it. I lose the words and find the intonation: musical and cacophonous. To understand my relatives I need only to be far away from them. Their voices fade completely by the time we find the goat path, paved now in cool smooth asphalt. Mom keeps pointing out to us square fields of yellow flowers, washed out by rain. The yellow flowers are used for vegetable oil and ends up on the dinner table most days of the week we visit. I want to ask her if she misses these fields, but I forgot how to say “miss” in Chinese. Maybe I am shocked she cares to find them beautiful. Watching him sit two rows down and away from us, I see how Dad could have been happier without a family. Maybe my dad stays in China, a bachelor contributing to particle physics, ripping apart the universe with a small black hole only to unwrap like a snow globe the five of us now as we sit now on damp stadium benches. The Shedd Aquarium is bringing dogs out right now, not otters, not even swimming dogs, just normal panting dogs that do tricks along on the outer ring of the pool. These dogs have been trained with only “positive reinforcement.” I swell with resentment and envy. Bandanas flap on their necks, their butts sent to tiny podiums. Mom laughs. And in America they have NAMES for dogs! We sit with my grandpa’s sister-in-law, who I have never met before today. Apple peel spools in her trash can, uncrumpled oranges between our fingers. Her husband returns with a tiny dog, the wriggling type. She tells us his name. Adorable. Celebrating the first hundred days of my cousin JJ’s baby. I cooed at the stroller at lunch two days ago, pretending I’d known all along she was married with a baby boy. The baby is round-eyed and plump. The baby’s father shares the same fat around the cheeks and neck. My other cousin LY shows up here too, with her fiancé. A wedding is planned for December this year. In photos, I stand half the height of these two girls, wearing pigtails and a squinting smile. Cousin LY is the reason Mom constantly tells me that Time is Running Out, because the men are Disappearing. Cousin LY is having a very hard time. Her parents are worried. Mom: All of China’s men marry downwards socioeconomically, leaving a large pool of rural men and highly educated women who don’t marry each other. Mom: I’m not going to be marrying a man. Mom: Men are very fragile, emotionally combustible. Maybe you’ve heard they’re disappearing. That’s why. Nothing we can do. LY’s hair was always cropped short in the butch cut mysteriously popular for Chinese women. She called my grandma qing mu. The 99 roses and expensive necklace her long awaited fiancé sent her eclipsed any mention of her career at a shipping company. Cousin JJ is not actually my cousin, but Mom’s much younger cousin. JJ lived in Shanghai with Xiao Gonggong and Xiao Bu Ah who picked us up from the airport. She must live with her husband, who still reminds me of Buddha, except constantly wearing a surgical mask. Xiao Gonggong comes and makes a toast, inviting himself to my impending wedding in America. I watch when my mother leans into the stroller to pick up the 100-day old, noticing that she has him in her arms like a breakfast tray, his soft head lolling on the edge of her forearm instead of in the crook of her elbow. I try to remember the last time my sister, now in middle school, was small enough to cradle. Did my parents know that America would take their children from them? Our family touches through the ends of chopsticks. Unwanted gifts. Or: silent favors, begging interpretation. They embrace only in wrestling matches, a flick of a bright red hongbao money packet passed back and forth, hands circling like basketball players. The day we leave, we keep weaving around a noisy iron claw picking up a smashed-up trash house; blue, red, white porcelain shards generating dust as we shove our suitcases in the van. My sister hugs Yeye, Nainai, as does my brother. I pat my grandma on the back. My parents wave. When we get to the main road, Mom twists in her seat. We forgot to look back as we drove away. Your grandparents were probably watching us as we left. Chinese dumpsters that looked like doghouses, excavated by trash men with metal shovels. Bonnie Fan asks readers to follows the unconnected line, "memory-telling" the image of self in transit, blood and fantasy.